More specifically, Breakwater beach in beautiful Brixham. There might be better beaches out there but this one is mine and I love it. From the gently rounded pebbles that on certain days appear to be almost entirely uniform to the slightly too sleep slope that builds anticipation as you stumble down towards the sea, from the water that glows turquoise in the sunshine to the panoramic views across the bay. B is for beach. 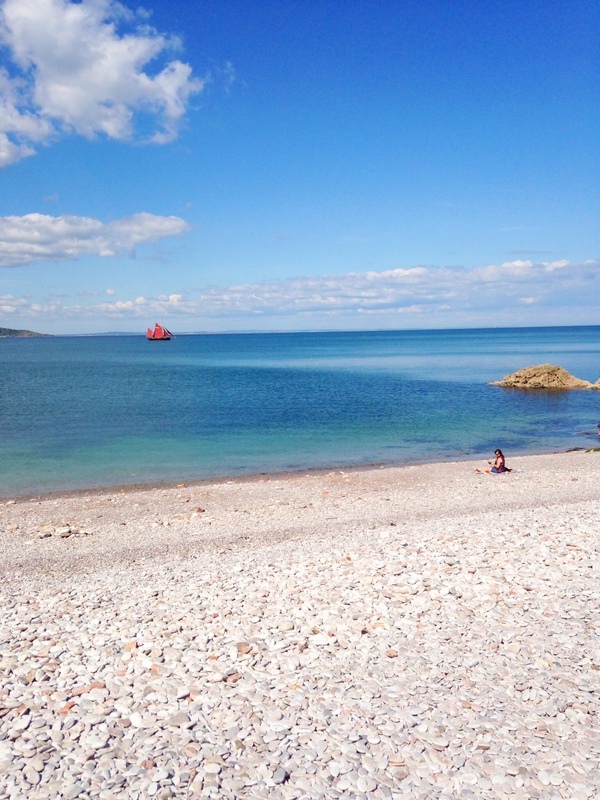 This entry was posted in Sophie is photographing, Sophie loves Brixham, Uncategorized and tagged #alphabetphoto, beach, Breakwater beach, brixham, Torbay on May 21, 2014 by sophieblovett. It does look pretty stunning in the sunshine. Especially when one of the vintage trawlers is sailing by! It almost looks like you are abroad! What a gorgeous looking beach and lovely blue skies. Missing the sunshine now! It is a gorgeous beach though whatever the weather. The colours are incredible when the sun’s shining! What I wouldn’t give to be heading to that beach…. with some sun!! it looks glorious! we have a pebbly beach here too, yes I wish it was sand, but so happy to live by the sea, great photo! Having spent the week in Cornwall and getting sand over everything I’m suddenly quite grateful that our local beach is just pebbles! It is awesome to live by the sea. I know we are very lucky – I still have to pinch myself some days! When the wind’s blowing in the right direction we can hear the waves from bed which is pretty awesome. It’s generally just great to have got out of the city! It’s pretty busy this week for half term… Looking forward to having it to myself again once everyone’s gone home!